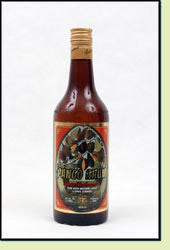 Andy: Pango Rhum has a strong pineapple aroma. This really isn’t bad. It’s very sweet with the predominant taste of pineapple with a hint of mango. It is pretty darned good. It is strangely good mixed with Diet Coke. A nice change on your typical rum & Coke. I really like it and would definitely buy it again. Adrian: This definitely smells like fruit. This rum can hold it’s own…it would be great with just a splash of pineapple. It’s a little too sweet for me mixed with Diet Coke…I think it’s is better suited for mixing in fruity drinks.